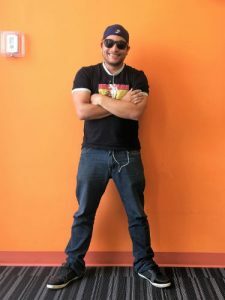 Our Student Ambassador, Juan Vicente, has been studying at EC English Center in Miami for 4 months. He’s an outgoing and energetic person who can make anyone around happy. He loves music and enjoys seeing people dancing, having fun. It’s our pleasure to have him as a student ambassador. Today, Juan wants to share with us about how he has improved his English so far. 1. Hi Juan! Where are you from? 2. What do you do in your country? I’m working as a freelance DJ. 3. How long have you learned English? I’ve learned English for almost 6 years in my country, but that’s just basic English. So, I decided to come to EC Miami to improve my English more. I would like to learn English from native teachers and talk to native people every day. 4. How long have you been at EC Miami? I started to learn at EC Miami on February 6th, 2017. I will be leaving on June 9th, 2017. Even though it’s only 4 months, I do realize that my English is improving dramatically. At the first time when I came here, I got a lot of difficulties in speaking and understanding English but now I can communicate in English with ease. 5. What do you think about the teachers at EC Miami? Who is the teacher you like the most? All the teachers at EC Miami are good. Each teacher has his own method, but all of them are helping me to improve my English. They are also very friendly. I love them all but the teacher who I like the most is Rafael because he always encourages me and helps me to perform better. 6. Which class do you like the most? I love the movie class because I can learn some slangs and know the way people communicate in real life. The teacher will help me to explain the meaning if there is something that I don’t understand. 7. What did you like most about your experience at EC Miami? Everyone here is so kind and helpful. Not only teachers, the staff also tried to talk to students most of the time. Thanks to that, my English is getting better in a short time. Thank you for the support from all the teachers and staff. Besides, I made a lot of friends here and learned about new cultures. This is one of the best experiences in my life.